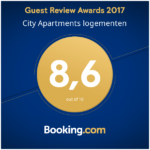 Many guests have reviewed City Apartments on Booking.com, we are proud of an average rating of 8.6. Voor de eerste keer in Groningen geweest en zocht een appartement dichtbij het centrum. De ligging is ideaal, nog geen 100 meter lopen en je bent al in het centrum. Alle bezienswaardigheden zoals Martinitoren, Station en musea liggen op loopafstand. Ik boek hier weer! I stayed in a humble studio apartment on the ground floor. It was clean and it had everything one needs to cook a nice meal. Good internet connection. Close to the old city center and university clinic. A friendly woman on the reception (note: you might have to wait a bit until she comes). I would definitely stay again. The studio was fully equiped and I was able to cook and have a comfortable accomodation.The location was nice as it was just a ten- minutes walk from the city center and the lady who was in charge was willing to help me with everything I needed. Aardig appartement, fijn dat het niet zo strikt was aankomst- en vertrektijden betreft. This location was close to the city center which provided easy access to restaurantes and shops. I stayed in a three bedroom apartment with my 21 year old son who was along with me on my business trip. There was good space and comfortable beds for us. We were there on business.